On my latest detour trip from Brussels, Belgium, I took a short trip to the Paris, France over the Thanksgiving holiday. Paris is probably my favorite city for food. There is a reason why the French have a reputation for setting the record for amazing chefs and fine dining, and you can see it in your every day gastronomical tidbits. While this is a complete guess, I am assuming that the French attempt to use fresh ingredients as much as possible. I never saw a squashed raspberry on a tarte de framboises (raspberry tart) in Paris but I have seen plenty in Brussels. 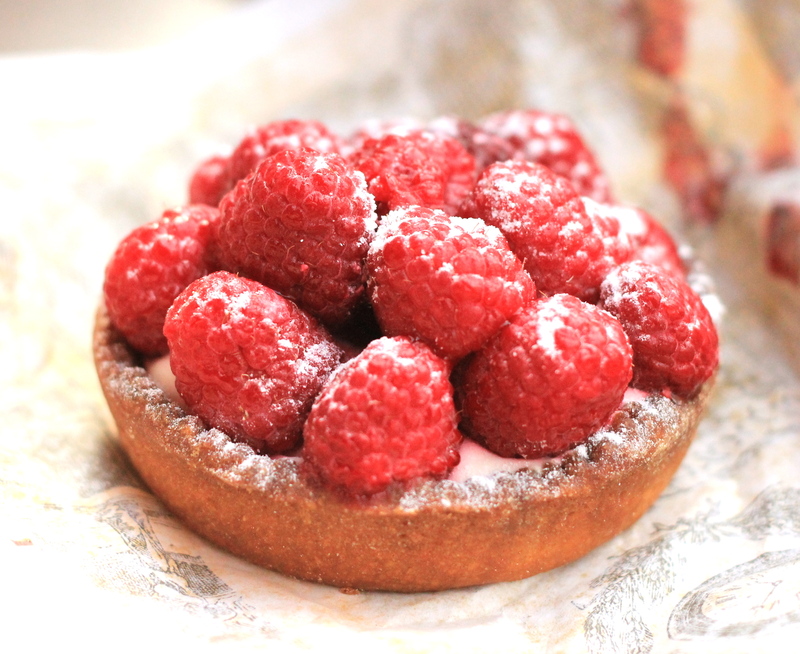 The raspberry tarte happens to be my favorite indulgence when it comes to Parisian pastries. In addition, each and every patisserie and brasserie that I went into over the weekend always had the scent of freshly-baked bread, my second favorite indulgence on a Parisian morning. Bread seems to be a main staple for the Parisians. A breadbasket will normally accompany a major meal such as lunch or dinner. However, if you order a simple sandwich (une sandwich de jambon y fromage) or a Croque Monsieur, you will not get a breadbasket as the main constituent of those dishes is bread. 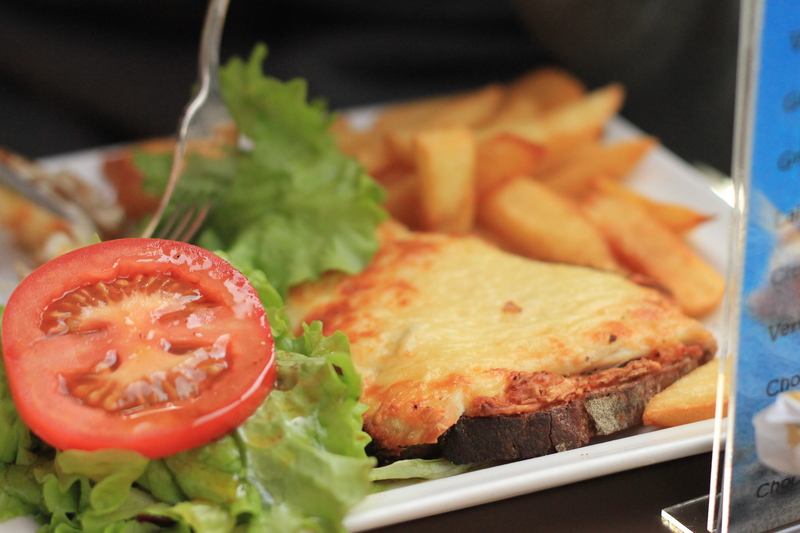 Croque Monsieur can be considered something of a “hot Parisian breakfast sandwich” – it is an open-faced sandwich with jam and cheese melted on top of a slice of thick toast. Usually it is served with a side salad. It’s partner, Croque Madame, is similar with the only exception being a sunny-side up egg placed on top. To my recollection, the egg-yolk is almost fully cooked and does not run as much as you think it would. Personally, I would like the egg to be done over-easy so the other side of the egg-white is cooked through, but the yolk is still runny enough to flow all over the ham and cheese. 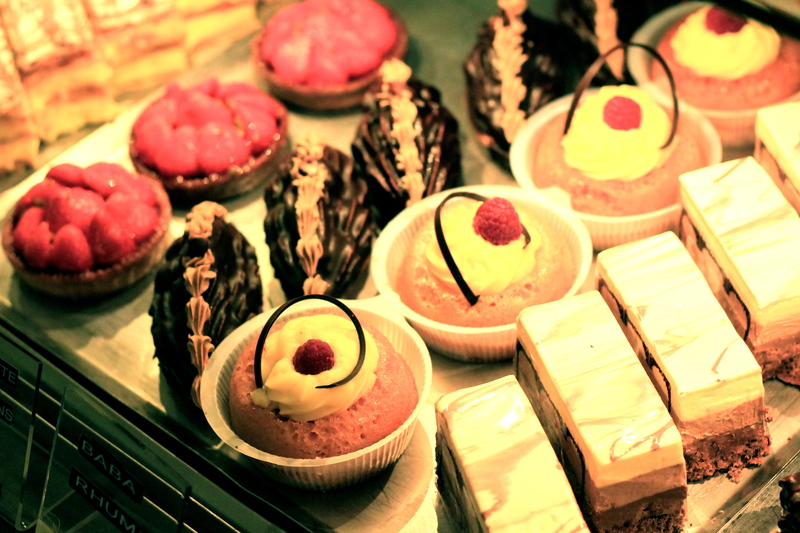 Walking into a Parisian patisserie is like walking into gastronomical heaven. Although I have to admit, when it comes to presentation and delivery, Asians still take the cake. There is just something about the fine details that Asians put into the wrapping and the decoration of the store that makes the purchase of a mere fruit tart an amazing and precious experience. However, the Parisian pastry store (patisserie) is literally lined with pastries galore. They will normally have the baked breads in one section, mostly in the back. There, you can see dozens of freshly-baked baguettes sticking out of random wicker baskets. In front of you, protected by a piece of what is actually pretty flimsy plastic is your beautiful heaven of pastries. They’ve segregated their baked croissants and suisse rolls (similar to that of a cinnamon roll) from the sweets such as the chocolate mousse cakes, raspberry tartes, fruit tarts, and so on. French portions are probably part of the reason why the Parisians remain so skinny. For example, a double-sized (doble) cup of coffee should be the amount of the ginormous soup mugs that you can find in the United States at Panera Bread. However, in France, they are slightly smaller than the smallest size of a Starbucks coffee cup. Perhaps for the average or well, over-average, American tourist, the food portions may be insufficient. However, I felt like it was quite well-balanced and well proportioned. It’s quite disappointing as I do love my food but the past two months have really taken a toll on my stomach, and it is just difficult to handle a large or moderate amount of food. I have increased my snacking though which makes Paris the perfect city for me. A patisserie or brasserie around every corner, a sandwich or crepe available at every turn, there is no possible way can a tourist go hungry. There were no exact restaurants or cafes so no reviews will be posted, but keep an eye out for the next food post or so! 11 Nov	This entry was published on November 11, 2011 at 20:24. It’s filed under bakeries, Europe, France, French, The Gastronome, The Traveller and tagged bakeries, Paris, pastries. Bookmark the permalink. Follow any comments here with the RSS feed for this post.